Taste test: These are kind of like regular Doritos, except that they're bigger and thicker, and rather than having a uniform flavor throughout the eating experience, these start out extremely mild  not spicy at all  and then in the aftertaste, you get the spice. The large chips are a bit of a challenge if you try to get the whole chip in your mouth at once  they just barely fit into my mouth. Smell test: Strong, good spicy cheese smell. Mmmmm. 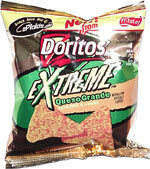 On second whiff, kind of like Doritos, only stronger. 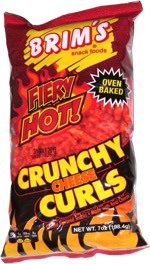 Trivia: There were nine chips in this bag. On the plus side, they were all unbroken. And the even bigger plus side, this bag cost a quarter.